October is the first month of the last quarter of the year, and a time to look back on the year to see how many of your goals you’ve accomplished, and look forward to determine your path for the rest of the year. If you’re like most of us, you had grand plans at the beginning of 2015, maybe in the form of New Year’s resolutions like losing 25 pounds or quitting smoking. If you’re an entrepreneur like me, you may have had ambitious business goals, launching a website, opening a bricks and mortar locations, or perhaps increasing sales on existing platforms. The reality is that setting goals is not enough. We need to set realistic goals with measurable results. If your ultimate goal is to lose 100 pounds in one year, how are you going to achieve that? You need to lose 2 pounds per week….that is a realistic target, but how are you going to do it? In order to reach your goal, you have to take that goal and support it with a workable plan. For weight loss, that would include some form of physical activity every day, and cutting out the daily pumpkin spice latte that has 8 teaspoons of sugar in every cup, or the evening junk food binge in front of the TV. However, that’s still not an actionable plan. You have to open up your calendar and schedule every visit to the gym, then actually meet those commitments. That’s the difference between setting a goal, and setting a goal supported by a plan to make it happen. My goal to open a bricks and mortar location? Needs an actionable plan that would include scouting a viable location, and determining all the costs required to get the door open. An actionable plan requires that each step in that process have a specific timeline. Look back on the plans you had for 2015, whether personal or business, and don’t just lament the fact that time got away from you, and you didn’t reach your goals. Ask yourself, “did I make a plan to reach the goals that I set?” If the answer is no, take this last quarter of 2015 to set realistic goals for 2016, supported by actionable plans, and you will not be in this same position at this time next year. Now I’m off to make some plans…. So, I originally intended to do one post featuring Hallowe’en themed goodies from my fellow handcrafted entrepreneurs, but that somehow became two, and now three! Colours to coordinate with any costume you can dream up! Pretty sure no witch’s brew smells as good as these candles! If you like to celebrate Hallowe’en, but aren’t into spooky, ghoulish decor, why not add a touch of Halloween colours instead? Channel your inner Norman Bates with this creepy selection! I’ve always enjoyed Hallowe’en, but growing up in rural Northern Ontario where houses can be miles apart, trick or treating was not a big part of my life. When I moved to Toronto, I lived in apartments where I never really thought about giving out candy. Then I started to help my friend decorate her house for Hallowe’en, and the rest is history. We did it for several years, and by the time we stopped, it was a major production that involved prepping for at least two weekends in advance, and took us most of the afternoon to set up. We dressed as witches, and delighted in the wide eyed wonder of the littlest ones, and successfully getting a rise out of the “too cool to be scared” preteens with black spider webs, artfully hidden! My friend’s large Victorian house has been sold now, and it has been several years since we “did” Hallowe’en, but I have a feeling that one of these years I will be dusting off my witch’s hat and giving it another go. In the meantime, I delight in all things Hallowe’en on the web, and wanted to share some that I’ve found this year. No Hallowe’en is complete without the perfect black lipstick, and this creamy delight is vegan and paraben free. It might not keep the unDead away, but you’ll smell great while trying to avoid them! Not sure if this one is supposed to ward off the Evil Eye or inflict it, but it’s downright creepy! This fun and yummy scented soap is the perfect touch for your guest bath during your Hallowe’en party! Okay, I am totally creeped out by rats and refuse to accept that they live in our cities, but this is just too well executed to ignore. Graveyard Cold Process Soap by Hell Flower Soap Co. Always a good idea to stay out of graveyards on Hallowe’en lest you run into one of these creepy critters! However, I truly love Hallowe’en, and am in awe of the creativity that abounds among my fellow handcrafted bath and body artisans. Full Moon, Black Rose, No Tricks, Just Treats or Samhain…..hard to choose just one so why not grab all 4? Add a little fun to your Hallowe’en grooming today! If you do a google, etsy, or Facebook search for “handmade soap”, you’ll find thousands of gorgeous bars, each lovingly handcrafted by soap artisans around the world. 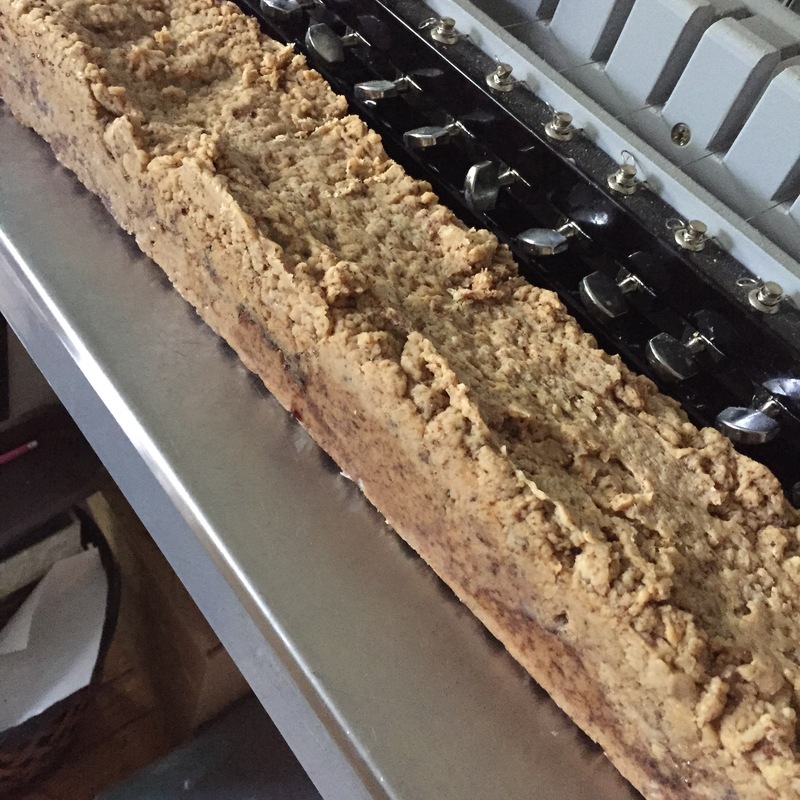 Unfortunately, not every soap we make turns out the way we envisioned it. 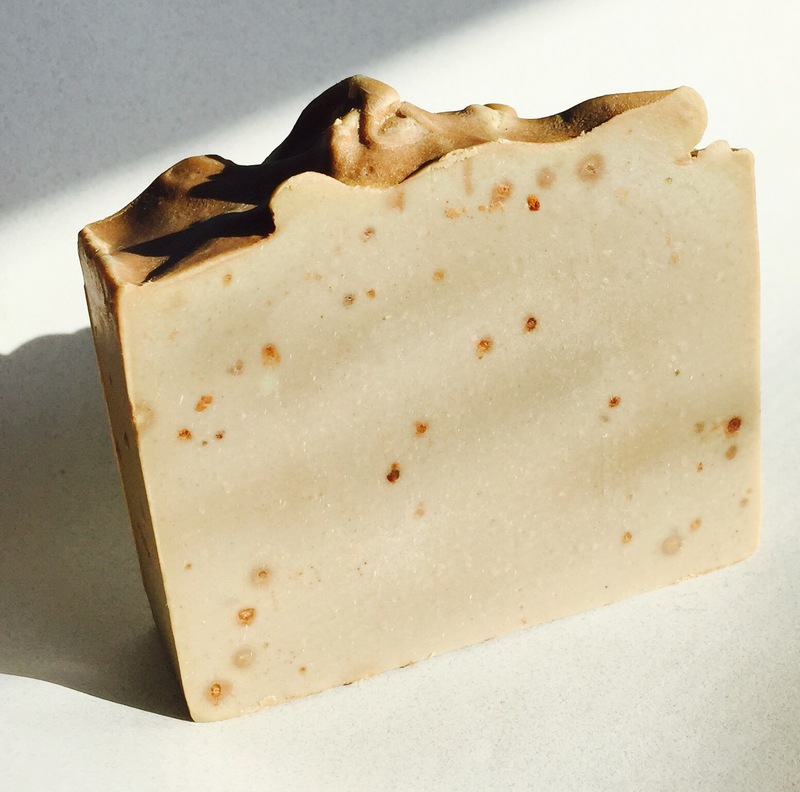 Mica can morph from pink to blinding orange, fragrance oils can discolour the soap (hello vanilla) or accelerate the process so fast that you end up with what we Soapmakers lovingly refer to as “soap on a stick”. We blame these mishaps on the soap gremlins that sometimes move into your house and wreak havoc on everything you touch. 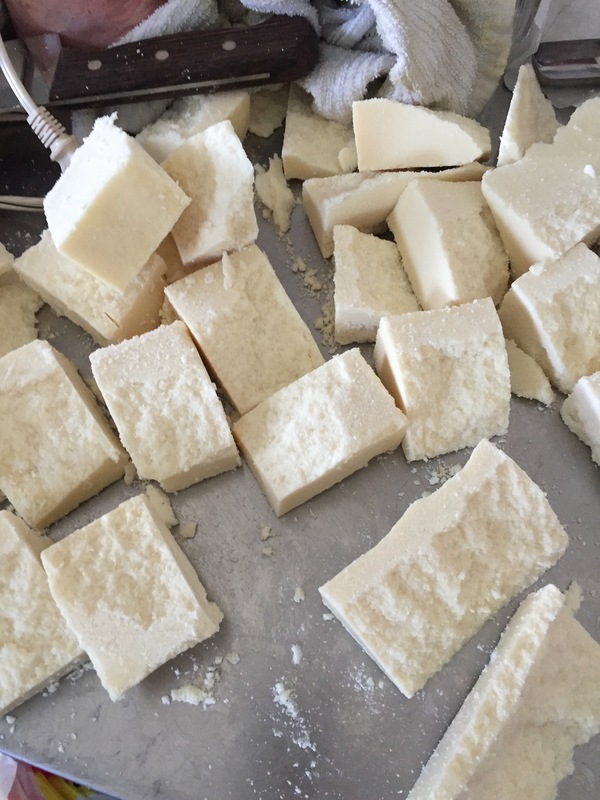 So today I’m showing you the dark, dirty, hidden side of soapmaking….the fails! 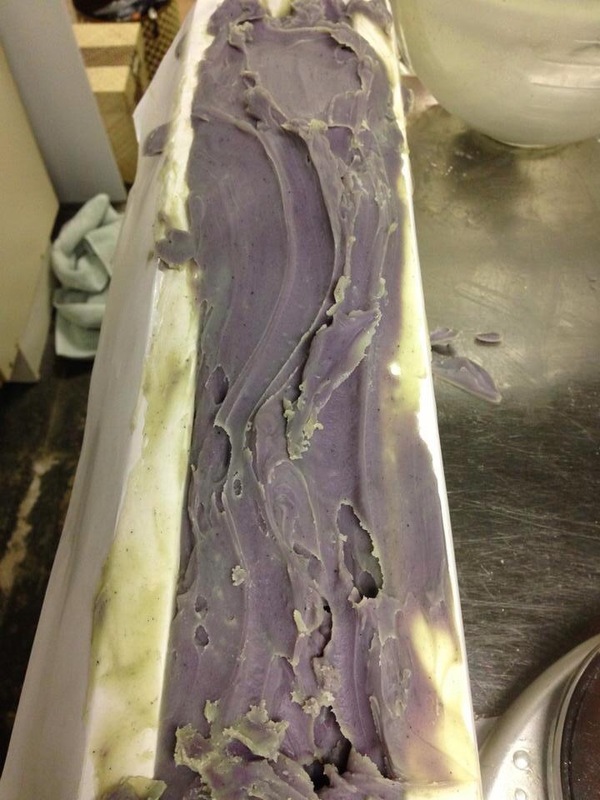 This fragrance oil turned my beautiful blue soap into an ugly grayish purple, and also accelerated it so much that I had to plop and push it into the mold. It eventually turned back to dark blue, but the bar was full of air holes, so I chopped it into cubes and added it into a new batch. This pile is what happens when you wait too long to cut your salt bars. You have to cut them when the soap is still so hot that it almost burns your finger, which for me is about an hour after pouring in the molds. 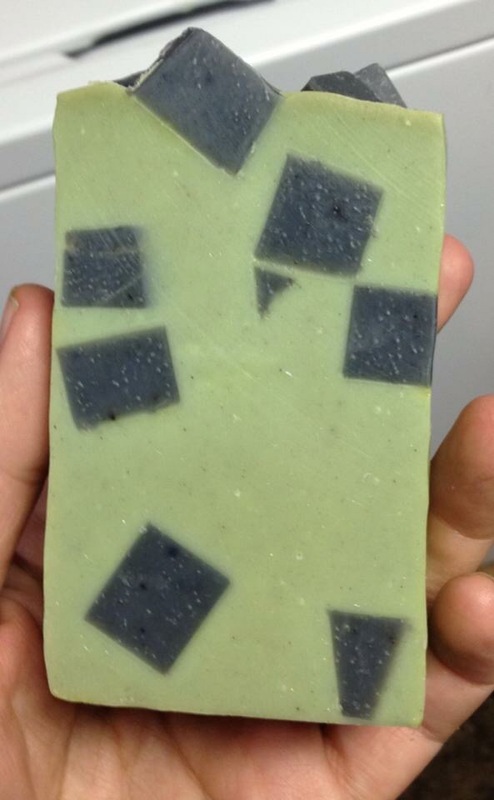 With this batch I was 15 – 20 minutes late, and this crumbly mess was the result….still fantastic soap, but destined only for my own shower, not for customers. Here for your viewing pleasure is the aforementioned “soap on a stick”. Many fragrance oils, especially some florals and spices will react when you add them to your raw soap batter, causing them to seize almost instantly. Then we have an example of what happens when you soap too hot when using honey. Anything that contains sugar, be it honey, milk, beer etc, heats up like crazy in the soap causing cracking, volcanoes (yes it does exactly what it sounds like!) and other messes. Usually when I make my oatmeal and honey soap, I premix my lye solution and let it cool down completely overnight before mixing the soap. This time, I forgot and poured it in while it was still around 200 degrees F. Oops. Totally unsalvageable. For comparison, this is what it should look like! Finally, we have my newest Christmas soap. I had such a vision for this one: just enough fir needle to make you think of the holiday without feeling like you’d been slapped in the face with a Christmas tree. A touch of frankincense and myrrh for warmth and depth. Just a kiss of vanilla to brighten the blend. It smelled divine. Unfortunately I made two mistakes with this one: I didn’t stir my palm oil well enough, which left small spots of undissolved stearic acid in the soap (you can see them easily because the vanilla formed little circles around them), and I didn’t use enough colorant to cover up the rather unattractive beigey green caused by the vanilla and Frankincense & myrrh fragrance oils. Sigh. The good news is that one of my guinea pigs (er, I mean good friend and valued consumer tester) just PMd me that this is her favourite fragrance of all my soaps, and believe me she’s tried most of them! I happen to agree….it smells divine, so will make its debut this Christmas as Winter Solstice, without the spotty complexion, and a beautiful deep green, I think. Watch for its unveiling soon! 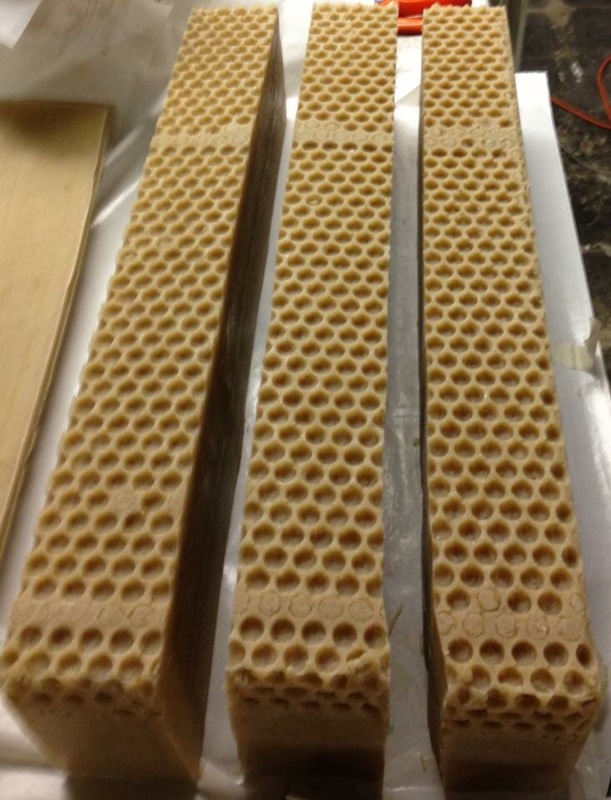 So the next time you see a beautiful handmade soap, think about not only the hours spent on formulating the perfect recipe, and envisioning the design, but also the dozens of test batches and disheartening fails that led to that gorgeous bar. Behind every bar of handcrafted soap is a soapmaker who puts his or her heart and soul into every batch. My family is blessed with thick, naturally curly hair that we don’t lose as we get older, but the trade off is that we go grey early. At age nineteen I saw the first strands of what was to become a distinctive white streak at the front of my hairline, which is a genetic mutation passed down from my mother. I affectionately referred to it as my witch’s streak, and I would most probably have been burned for a witch if I had the misfortune of living in Salem in the 1600s. Fortunately, I don’t, so it has been an oddity that has mostly been disguised by hair colour over the years, and I was never too perturbed when it started to grow in again from the roots. However, at some point over the last 10 years, other things started growing in from the roots…..yes, the dreaded grey hair! Now I have been blessed genetically with grey hair that is actually silvery white, so it is rather an attractive colour. That doesn’t mean I was ready to go grey. So, over the past several years, I have fought the good fight, held the line, and refused to give into the inevitable. Unfortunately, I have also been blessed with hair that grows quite quickly, so every two weeks, I start to develop a white stripe right down the middle of my head….no-one can rock the skunk look! After much deliberation, I have decided to embrace my silvering hair, and am letting the colour grow out. This means daily ponytails to disguise the “skunk” stripe until my hair is long enough that I can cut the colour off without looking like I’ve been given a military haircut, which looks stunning on supermodels, but on me? Not so much. 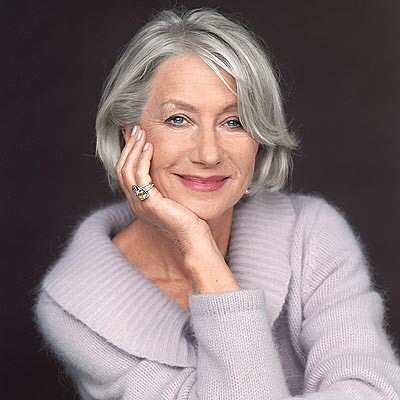 While I wait for “the big cut”, I’ve been looking at images of celebrities who have gone for the grey, and it’s beautiful. What do you need to rock the look? A beautiful smile, a little more makeup than I’ve worn in years (white/grey hair can leave you looking washed out) and for me, a new pair of bold funky glasses. So wish me luck, and watch for my new profile pick in the near future….maybe for Christmas? I’m told that a natural part of aging is noticing how quickly time seems to fly by. When we were kids, summer lasted FOREVER! These days it seems like the season has barely begun before it’s over. With this perceived hastening of time, comes our sense of panic at not being able to fit everything we need to do into our day. How many of us dutifully sit down and draw up our To Do List, which we’ve been reassured is the key to organizing our lives and Getting Things Done, only to look at that list with a sinking feeling, realizing that there is too much list, and not enough us! This leads us into the ever so popular coping strategy known as Multi-Tasking. Some tasks are ideal for multi-tasking: folding laundry while watching TV or chatting on the phone with a friend, unloading the dishwasher while your coffee brews. This is how to use multi-tasking effectively. How not to use this strategy? Telling your significant other “of course I can stop and pick up your dry cleaning on my way home”, when you have already committed to picking up the kids, stopping to grab takeout for dinner before the kids hockey practice, and dropping by Staples to pick up the brochures you ordered for your next show. The reality is, there are a finite number of hours in a day, and you can only fit a finite number of tasks into them. Trying to do too much leaves you exhausted, irritable and stressed, which leads to a depressed immune system, and ultimately any number of illnesses, which will bring you to a full stop. As entrepreneurs, we may be filling multiple roles: businessperson, wife/husband, mother/father, girl guide/Boy Scout troop leader, friend, daughter/son, and so on. With so many diverse responsibilities demanding our attention, it is very easy to get shoved to the bottom of the list of priorities. There is always something more important to do than take care of yourself. Do I constantly have a headache? Do I catch every bug that comes my way? Your body is trying to tell you something: I’m in distress! If we don’t learn to carve out some time for ourselves in our schedule, time dedicated to keeping us strong and healthy through physical activity, meditation, or just downtime to recharge our batteries, eventually we will be accomplishing nothing, because our bodies will force us to shut down. So, what’s it going to be? 30 minutes a day of “me time” (an hour would be better, but you have to start somewhere), or a week in bed because your depressed immune system couldn’t fight off that nasty flu that’s going around?